Ontos: "What on Earth Had Prompted the Man to Rush Crazily into the Room and Commit Murder?" "What on Earth Had Prompted the Man to Rush Crazily into the Room and Commit Murder?" By Richard E. Glendinning (1917-88). 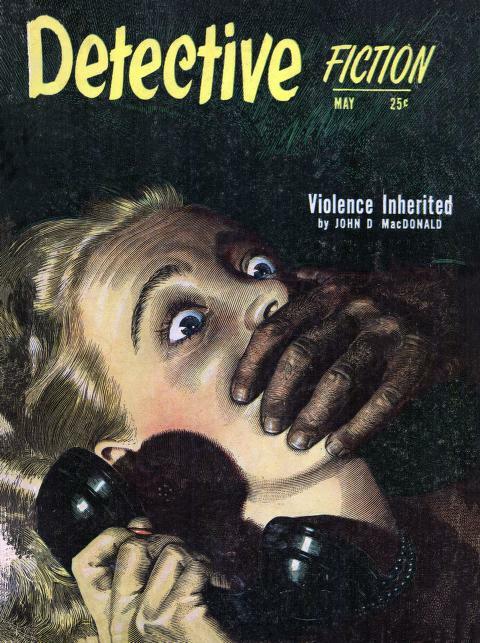 First appearance: Detective Fiction, May 1951. "Psychology suddenly took on a new significance." blame this one on Murphy—in fact, the law just might pin it on him . . .
"Who truly knows the channels of the human mind?" "It was murder and Irene was a witness." "It was supposed to be a knife. That scoundrel, Hastings! Intentionally mixing things up. If this is his idea of a joke—"
"Word-association! There's nothing to it." "Men are not allowed above the first floor, but the girls are permitted to entertain dates in a small and, I must say, quite dimly lighted parlor off the lobby. Miss Daniels had a man in there last night." "The ramp was high and George's head was crushed." ". . . who used to teach dramatics here until a few months ago." "[His] strong right hand was holding aloft a soggy sponge, bent upon destroying the words forever." Comments: Have you ever watched a TV show in which a crime occurs in a classroom full of unsuspecting students, a "crime" that's been preplanned as a demonstration and is sup-posed to harm no one, but somehow it goes wrong? We can't be sure, but our story might be one of the first, if not the first, to do so. The word association test, usually badly handled in detective fiction, is used in a fairly intelligent way here. However, the Lieutenant could be right: "The D.A. will have my scalp." - Just about every one of Richard Edwin Glendenning, Jr.'s FictionMags Index list stories is hardboiled tecfic, making today's story different from his usual output: "Author, editor. Born in Elizabeth, New Jersey." You may recall that he was also responsible for "The Light Finger-ed Santa" (HERE). 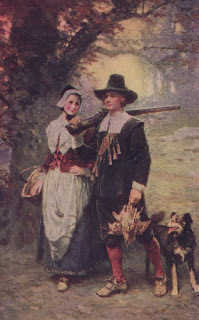 - One of the characters says, "I never liked the story of John Alden, either"; see (HERE) for what he meant. "There Is Small Point in Denying Your Calling"
In the Soup with the S.I.U.P. "I Want You to Help Me Commit a Crime"
"No Corpse, No Weapon, No Witnesses"